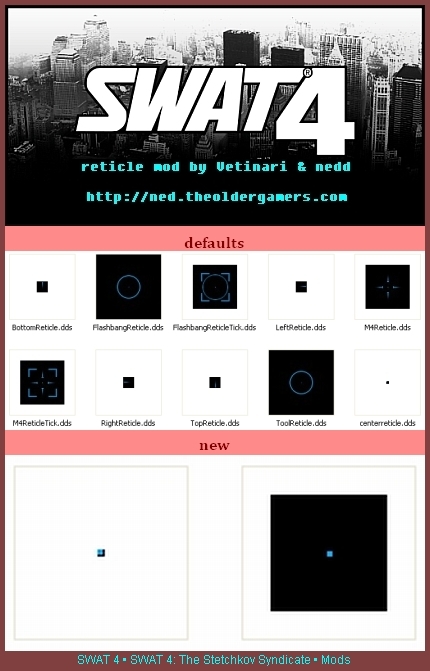 This small mod alters the SWAT 4 reticle in both singleplayer and multiplayer. The various Weapons and equipment in the game have various reticles ranging from the weapons having a center dot with spread indicators to tools having a center dot inside a circle. This mod removes all reticle parts except the dot and makes this dot larger. I would have removed the reticle completely if the game had an aim-down-site function.